Families that eat together, stay together! What if we tell you it’s literally true, especially when the family meals are hearty, love-loaded and soulful enough to be shared with the world? 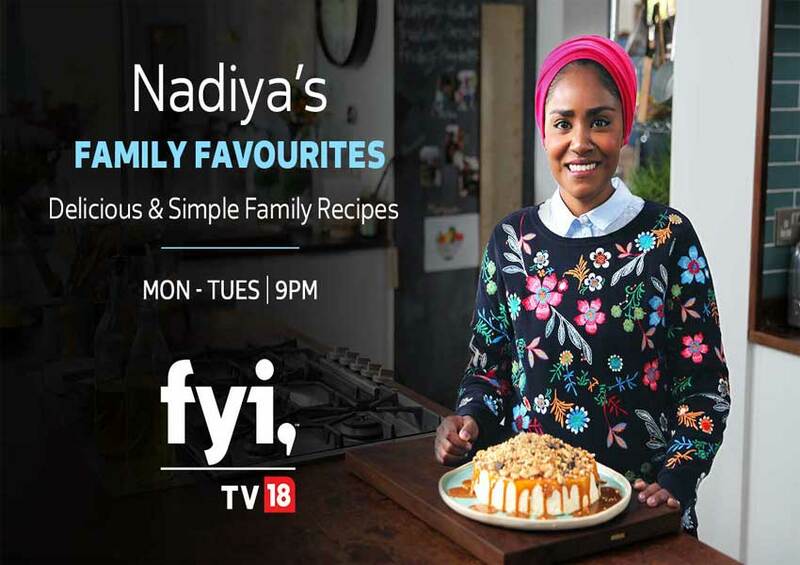 Well, that’s exactly what the forthcoming exclusive series “Nadiya’s Family Favourites” premiering on FYI TV18 on Monday 15th April, 9 PM is all about. Nadiya’s Family Favouritesseries will bring The Great British Bake-Off winner Nadiya Hussain at the forefront. She will be seen sharing with the viewers how and what all she serves up for hearty meals for family and friends, occasions and celebration, along with meeting inspiring home cooks and trying out their recipes in the quest of a good home food. Each episode is curated with different themes to excite your taste buds, which includes “Wind Down Weekends”, “Family Day Out”, “Manic Weekdays”, “Nothing in The House”, just to name a few.The creations and recipes across the series will vary, ranging from Nadiya’s family meal recipes like Carrot Cake Pakoras, Spinach & Paneer Kati rolls to Mocha swirls. She will also meet some of Britain’s most inspiring home cooks along the way as they share their delicious & simple family recipes. Each episode will teach aspiring cooks how to serve up a feast for the family on any occasion. So, this April, don’t miss the soulful journey of Nadiya’s Family Favourites. Mango People Media’s Love, Lust & Confusion Season 2 is out now!